Security Company or In-House Security – Which is Best? Are you considering upping your security levels either at your property or business? In order to protect your family and the people that work for you, it sounds a good idea. But the difficulty lies in knowing which sort of security to opt for. Is it best to hire from within your business or place your trust in an outside security company? To help with your decision, we’ve examined your options more closely below. On the face of things hiring a full time security guard sounds a great option. After all, if they’re there everyday they’ll get better acquainted both with your staff and with your facility. As an integral part of your team it’s easier for them to sniff out your weak spots and identify your unique needs. As an employee, though, he or she does face certain challenges. For example, it’s impossible for them simulaneously carry out several security functions. They also operate from within their own little ‘bubble’. In other words because they’re not part of a larger security organisation they don’t get regular exposure to the latest security technologies or practices. In fact, any additional training may be limited to just once a year, if that. 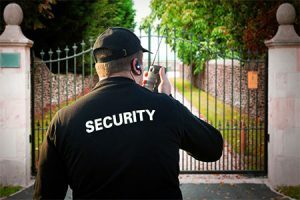 Hiring a guard from a security company has a distinct advantage in that their role is perceived as more than just a ‘job’. It’s what they do, and as such they live and breath security all of the time. Because security is their business they stay up to date with the latest trends and practices in order to remain on a par with their competitors. In addition to this, they also ensure that their personnel are fully trained too. This gives them the upper hand when compared to in-house guarding. In most cases the quality of service is better, because it’s what they do and it’s important to them. Having guards that are highly trained gives them a competitive edge as well as a lot of clients. Hiring from a security company could also cost you less money, as often their services are cheaper than hiring a full time guard. One other option is to hire a concierge security guard. This is one who as well as being highly trained in all aspects of security is customer service trained too. This means that he or she can man your reception desk, meet and greet visitors, answer telephone calls, and still keep their guard’s eye on everything that is going on around them. They’ll know the regular comings and goings of your employees and recognise any unusual or suspicious behaviour. At the end of your day they can also check round your facility to ensure that all the windows are shut and the alarms are correctly set. In the event of sickness, your security company will be able to provide a replacement guard – now that’s what we call having the best of both worlds. We’d recommend that you schedule a risk assessment in order get a better understanding of your security needs. That done, it pays to weight up the benefits versus the cost of each option to decide what works best for you. Don’t take too long doing this, however, since delays such as these can make your business a sitting target for potential burglars and those intent on doing damage. To get a risk assessment for your business call MA Security Guards on 1300 020 406.